But up until now, there have been few ways to intelligently interact with live TV with your mobile outside of money extorting SMS votes (with a few decent tries, like MLB’s At Bat 11 application which is good at providing stats and watching games, but does not provide true interactivity). Norwegian television channel TV 2 has changed that with their Tour de France app. They claim it is the first app that interacts with live TV as well as even showing TV live in the app in case you are not in front of the TV (as well as providing additional footage to the TV feed). Now I find watching cycling for hours as much fun as an all day visit to the dentist. 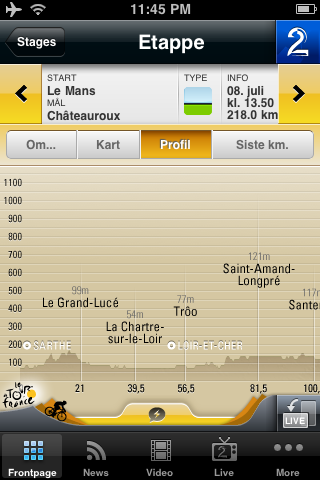 But this app is simply so well done I found myself checking it regularly during the now ongoing Tour. Designed for the tablet and phones, the app embeds visual maps of the route, where the riders are, results, rider info – and more importantly number of ways to interact such as chat and polls, in addition to the live TV and canned video footage. The app was developed by Norwegian developer Reaktor (TV 2 did the Android themselves though), and the interactivity in the form of polls and quizzes is provided by Never.no. Jointly they have set a great example for other media companies to follow. Where they do miss out is the connectivity to Facebook. If I vote, it should show in my stream. If I could ‘like’ a participant or a video clip, it should show in my stream, etc. That way they would have had multiple ways to drive downloads of and interest in the app, as well as the potential of bringing in contributions from users not on the app. 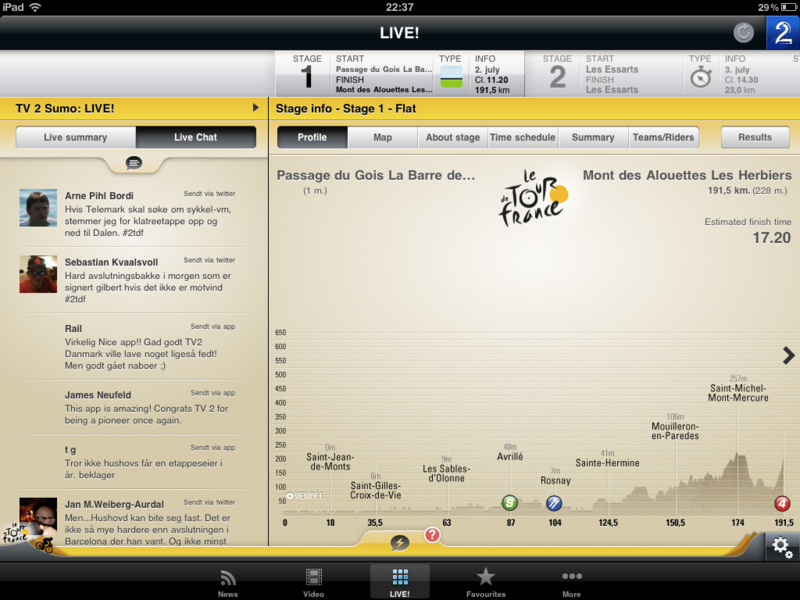 But this is by far one of the most engaging apps I’ve seen for interacting with live TV. 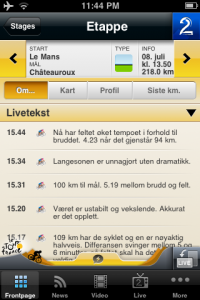 They have also managed to translate the experience well from the bigger tablet format to the smartphone screen. Being someone who actually loves watching a bunch of competitors ski cross country for 50km, I hope they’ll have an app ready for the next Nordic world ski championship. This should be a wake up call to media companies. Several of them, such as the NFL which has a great web app for watching games, have dipped their toes on the web. But the potential as a phone/tablet app is huge due the fact that you probably have it with you where your are watching (whipping up the computer in a sports bar is and will continue to be a pretty bad idea), it can provide a good experience both on tablet and mobile, and even use device features such as augmented reality and GPS (for instance, why not have a “local” poll in addition to a global poll, etc), it has the cool factor to it, and truly belongs in the most interactive and personal device that is with you 24/7. I think the next 12-18 months will change how we watch TV – all thanks to a beautiful relationship between mobile and TV. 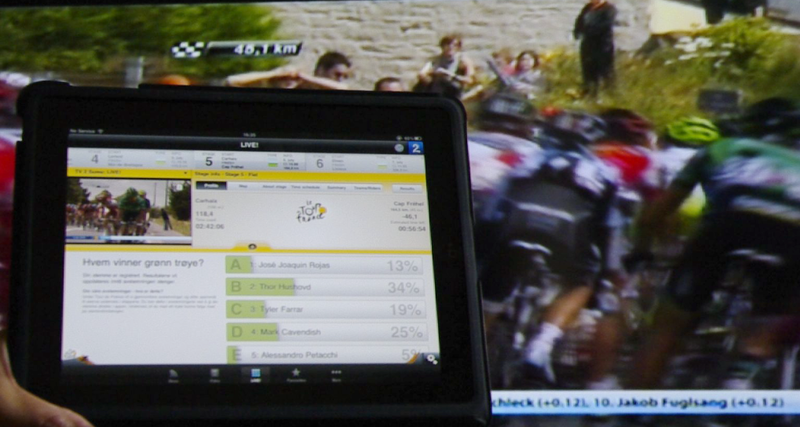 Tagged with interactive tv, interactivity, iPad, iPhone;, MMS, Smartphone, SMS;, social, tablet, Tour de France.